Hand alignment is key to forming a proper putting grip. 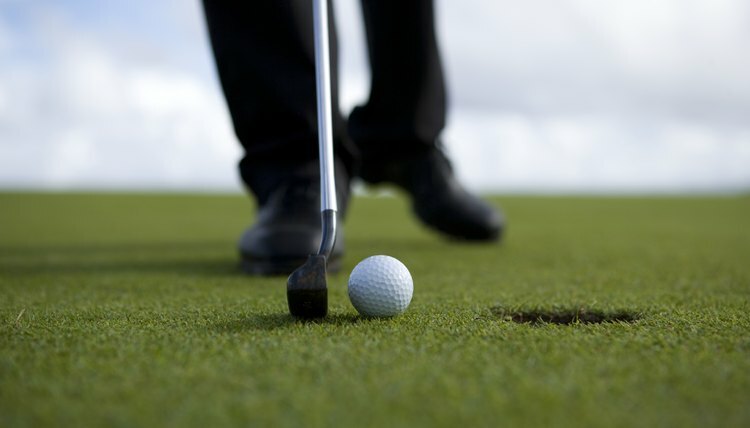 An improper putting grip will jeopardize your overall golf game. The right grip is essential to good swing form and distance control: Without it, your chances of successfully delivering a ball to the hole are sharply diminished. Improving your putting grip takes a bit of know-how and practice, but it is well worth the effort. While longtime golfers can experiment more freely with various grip patterns, beginners should concentrate on the fundamentals in order to correct their putting grip. Align your body. Stand between the hole and the ball, parallel to the target line. Your club face should be aligned with the body as you face the target line, according to the book "Teach Yourself Visually Golf." Turn palms toward each other with the putter evenly placed between them. Place your non-dominant hand on your putter grip at the upper portion. Fingers should be lightly curled, with your thumb running down along the grip’s flat front. Position your dominant hand on the lower portion of the grip. Encircle the grip lightly with your fingers; both thumbs should now be running down the flat portion of the grip, one higher than the other. PGA professional Gary Lipelt says that a light grip is necessary to avoid the tautening of muscles that could send a ball wayward. Your pinkie finger on the lower hand may overlap the index finger of the upper hand or vice versa. Pull your elbows in, close to your sides. Keep your wrists stable so that the main motion is in your shoulders and arms when you swing. What Is the Proper Grip Pressure in Golf?